Lilly Fong was the first Chinese-American elementary school teacher in the city and was the first Chinese-American to sit on the Nevada State Board of Regents. She worked tirelessly for education during her 52 years in Las Vegas. She and her husband, Wing Fong, built Las Vegas businesses. Lilly Fong was born in Superior, Arizona in 1925. She received an education degree from Arizona State University. In 1950, she relocated to Las Vegas to teach and became the first Asian-American elementary school teacher in the valley. She married Wing Fong, a local businessman, and they opened the well-known Fong’s Garden restaurant on East Charleston Boulevard while working in real estate. Fong was active in the local branch of the American Association of University Women (AAUW). She took an active interest in the state of education in the city and worked to support UNLV in its early days. She and her husband raised money for the UNLV Performing Arts Center in late 1960s. Lilly Fong’s dedication to education led her to run for the Board of Regents. She served as a regent from 1974 until 1984. As a regent, Fong worked to identify alternative sources of funding for higher education. She also worked to promote the development of UNLV to keep pace with the rapid growth of Las Vegas. 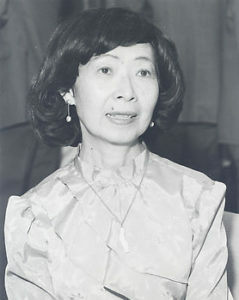 Following her narrow defeat for the Board of Regents in 1984, Fong continued to work to improve educational opportunities, teaching part-time on the college level. She also worked to establish an endowment fund for a Chinese language program at UNLV. UNLV honored Fong’s contributions by naming the geosciences building for her in 1985. She was named a Distinguished Nevadan in 1998 with her husband. Lilly Fong passed away in 2002, but left a legacy on Las Vegas’ educational system. For further biographical information: Lilly Fong papers. Nevada Women’s Archives. Special Collections, UNLV. Collection number T-117.